The meticulous and cautious Oh Se-chang. August. 24, 2018 07:54. . Most of the art collection by Jeon Hyeong-pil at the Gansong Art Museum has been selected by the discerning eye of Oh Se-chang. One of 33 independent fighters who signed the Declaration of Independence, Oh left behind outstanding work in identifying and collecting paintings and calligraphic works, seals and calligraphy. Such works are housed at Seoul National University and Sungkyunkwan University. 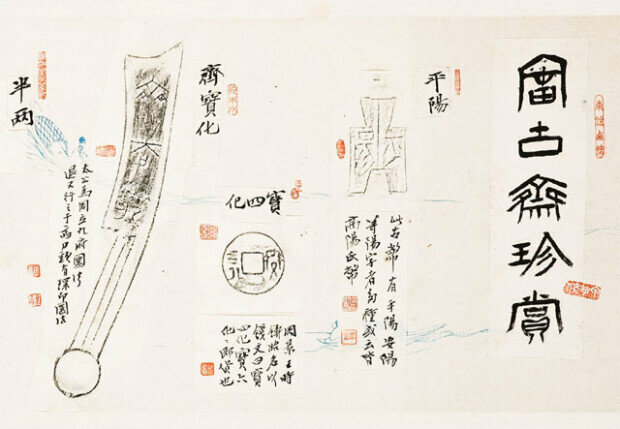 An art piece titled Bugojaejinsang is a rubbing of rare currencies used in the seven dynasties of China including Zhou, Qi, Han and Xin, with the explanations written in tiny writing. In the middle, Oh had printed 28 stamps, engraved by himself, some of which were so small, measuring only 3 x 3 millimeters in size, that they had to be looked through a magnifying glass. Such small writings indicate a meticulous, cautious, focused, precise, realistic, rational control, wary, disciplinary, self-controlled and modest nature. People with such personality may show a lack of confidence and passion, insecurity, hesitation and pettiness. Scholars who require logical and meticulous mindset are known to write small. Oh’s writing is small and detailed but not monotonous, reflecting change and irregularities. Such characteristics imply artistic sensitivity and creativity. Having such a meticulous, cautious yet artistic nature is necessary for identifying drawings and calligraphy, which shows what a difficult task it is. Identifying calligraphy is not done from a broad-minded perspective, but rather with hesitation and meticulous thinking.